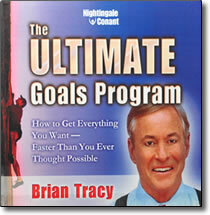 The Ultimate Goals Program CDs by Brian Tracy – Discount! Your ability to set and achieve goals will determine your success and happiness more than any other skill you can ever learn! You can’t hit a target that you can’t see. The starting point of great success is when you sit down and decide exactly what you really want, in every area of your life. This program will show you how to do this, better and faster than you ever dreamed possible. The Ultimate Goals Program: How to Get Everything You Want — Faster Than You Ever Thought Possible is the most complete and effective goal-setting and goal-achieving program ever created. In this exciting program, Brian Tracy takes you through a simple, proven step-by-step system that you can use immediately to achieve anything you really want in life. Brian has shared these ideas in more than 2,000 talks and seminars over the past 21 years, teaching more than 2 million students how to dramatically improve their lives with goal-setting and goal-achieving strategies. Brian’s graduates have transformed their lives, moving from frustration and unhappiness to success and high achievement. They have gone from rags to riches, from worrying about money to becoming self-made millionaires. And so can you. In this powerful program, Brian teaches you the 21 most important principles of goal setting and goal achieving ever discovered.